AP Gurukulam CETs (AP Residential CETs);RS CETs, RJC CETs, RDC CETs, APMSCET 2018: APGPCET 2018: APREIS, APSWREIS, APTWREIS, APBCWREIS 5th Class Entrance Test; APREIS APRS CET, APRJC CET, APRDC CET; APSWREIS RS CET, AP Gurukul RJC CET, APSWREIS RDC CET. APTWREIS RS CET, AP Gurukul RJC CET, APTWREIS RDC CET; MJPAPBCWREIS APBCWREIS RS CET, APBCWREIS RJC CET, APBCWREIS RDC CET; APMSCET, APMS Inter Admissions. AP Gurulams RS CETs, RJC CETs, RDC CETs, APMS CET. 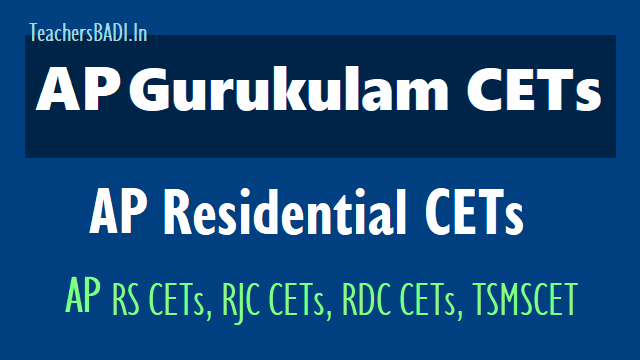 AP Gurukulams (APREIS, APSWREIS, APTWREIS, APBCWREIS Residential Schools, Residential Junior Colleges and Residential Degree Colleges).. AP Residential CETs. 4. APMSCET for 6th to 10th Classes admissions in AP Model Schools in Andhra Pradesh State. APSWRIES RDC CET ---- ----- ... APSWRDC CET? APTWRIES RDC CET --- --- ... APTWRDC CET? APMREIS RS CET ---- ----- ---- TMRS CET? APMREIS RJC Admissions --- --- ---- RJC Adm? 1. APGPCET 5th Class Entrance Test: AP Gurukul CET, AP SC ST BC Gurukul CET, APREIS, APSWREIS, APTWREIS, APBCWREIS APGPCET 5th Class Entrance Test. 1. APRS CET 6th, 7th Class Entrance test (APRS Gurukul CET). 1. APSWREIS 6th,7th,8th,9th class Entrance test, APSWREIS RS CET, APSWRS Gurukul CET, AP SC Gurukul CET. 3. APSWRS RDC CET, APSWREIS RDC CET, AP SC Gurukul RDC CET, APSWRDC CET for Degree 1st year admissions. 3. APTWRS RDC CET, APWREIS RDC CET, AP ST Gurukul RDC CET, APTWRDC CET for Degree 1st year admissions. 1. APBCWREIS 6th,7th,8th,9th Class Entrance test, APBCWREIS Gurukul CET, APBCWRS Gurukul CET, AP BC Gurkul CET. 3. APBCWREIS RDC CET: AP BC Gurukul RDC CET, APBCWRS RDC CET, APBCWRDC CET for Degree 1st year admissions. 1. APMS 6th,7th,8th,9th,10th Class Entrance test. 2. APMS Inter 1st year admissions.